This is what’s oppostite my new workplace in Camden street, Jewellery Quarter. 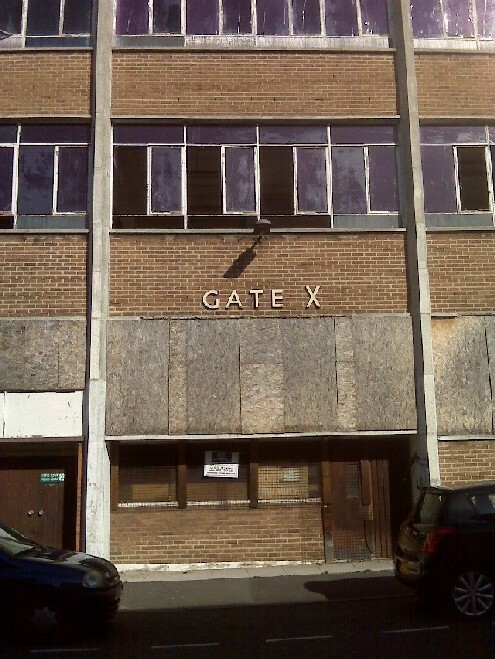 I believe it’s a former GKN works (due for redevelopment – item F on this map) but is now where the smokers from where I work hang out. Having trumpeted my return to working in the Jewellery Quarter I actually find myself in a rather undeveloped corner of it which still has large empty factories and small, usually busy, warehouses. That’s fine as I like undeveloped corners of the city and walking from the centre to here takes you through the back of the library – now there’s a nice messy undeveloped bit. It sells okay Starbucks coffee for half what it costs on the high street. The cafe doesn’t understand portion control for cakes. It is close to the canal networks for pre, during or post work runs. It has shower facilities for the above. People – both work people and customers for shops. Lots and lots of place for lunch. A diverse population of blue and white collar workers. In a fight between Digbeth and Jewellery Quarter I wonder who’d win? This entry was posted in Birmingham, Creative Industries and tagged Custard Factory, digital birmingham, GKN, jewellery quarter, service birmingham, st george's works. Bookmark the permalink. No contest Dave. As a JQ resident who has just opened an Art Gallery in Diggers, there is only one winner, and it doesn’t being with D. Love the photos btw. I will come and visit soon. G.
I think the JW is fab and the architecture/fittings are fantastic!